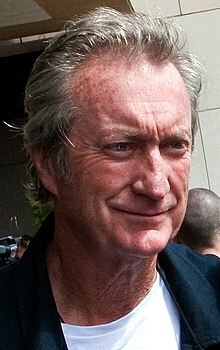 Bryan Neathway Brown, (born June 23, 1947) is an Australian movie, television, stage, and voice actor who is known for his roles in The Thorn Birds, Beautiful Kate, Cocktail, Along Came Polly, Australia and Peter Rabbit. Brown was born on June 23, 1947 in Sydney, Australia. He has been married to Rachel Ward since 1983. They have three children. ↑ "Rachel Ward: Not just a glamour girl". The Sydney Morning Herald. 13 June 2005. This page was last changed on 20 February 2018, at 05:04.